Watoto Children’s Choir IN CONCERT this Saturday – April 21 at 6 pm – A “Don’t Miss” EVENT! There are times when you hear that you should have been at church to hear something truly special, but you look back in regret because you missed it. Please do not let this be one of those times! 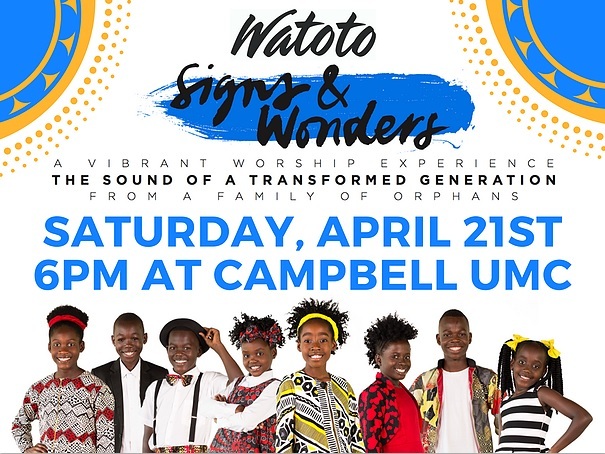 All are welcome and all are invited to attend what promises to be an enormously uplifting and spiritually rewarding experience as the Watoto Children’s Choir performs in the Campbell UMC Sanctuary this coming Saturday evening, April 21, 2018, at 6 pm. Invite those you know to come and hear this amazing choir of Ugandan orphans as they minister with voices, instruments, energy, life, vibrant visuals, and incredible music. Our God reigns! Come and hear these gifted young people sing and share about it and be sure to tell everyone you know!